carrot ginger parsnip soup with crispy shallots, bacon & goat cheese. long title soup = extra flavor soup! this recipe is sort of out of my comfort zone in a few ways...but i have enjoyed it so much! i never really fancy just a plain ol' bowl of liquidy soup. i always want some sort of texture or something to chew on. enter crispy shallots, bacon crumbles and chives. and goat cheese for extra creamy flavor. part 2 of dancing a wee bit outside of my comfort zone is using yellow curry powder in this soup! i weirdly don't really enjoy the flavor or smell of indian curries. i can see why people think its warm and flavorful and delicious, but its just not my cup of tea somehow. i want to like it. in the same way i want to like seafood, but i just don't. wahh. but! i had some sort of soup last fall with just a touch of curry powder in it, and i felt it made sense. it gave the soup a little something extra without being overpoweringly curry-like. and it worked fabulously in this carrot ginger soup. woo! baby steps, y'all. um, also... i made this soup way back in octoberrrrrr. the original photos i took were in much bigger bowls and it just didn't make sense at all. you'd nevvver eat that amount of soup in one sitting. it just took me ages to get around to getting much shallower bowls. actually, these are plates, haha! but its the perfect serving size for a rich soup like this. the good news about my procrastination here is that i know that this soup recipe freezes very well and you can thaw it out months later and jazz it up with all the toppings! the toppings are really where its at for me. the crispy shallots not only make the kitchen smell AmAhhHhhZiNg, but they taste amahzing with the rich carrot parsnip ginger combo. 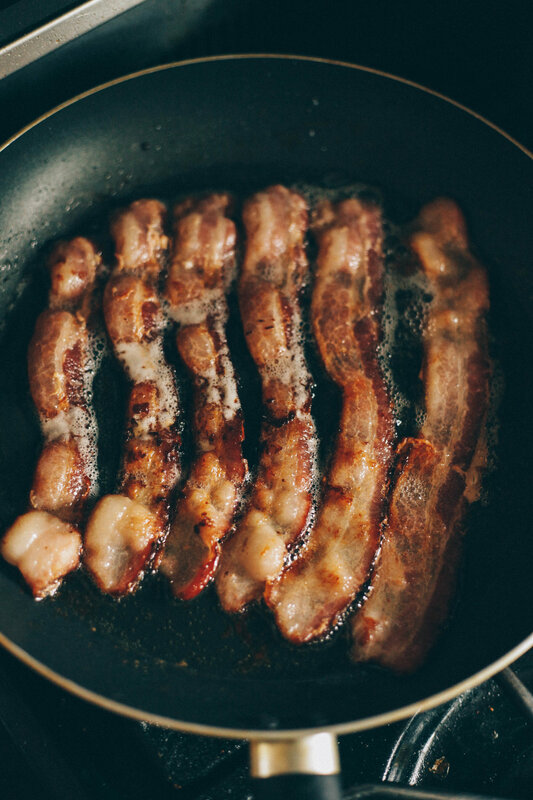 bacon, because...bacon. chives because, greenery. & the goat cheese is definitely key. so really...don't skip the goat cheese or the crispy shallots. they're what make this soup worth soupin'! right now i'm on the mend from my 2nd gum grafts surgery, cuz i'm a g-ma at heart and i prefer walnuts in my brownies and i've always truly loved werther's originals, raisins, and grape nuts. see also: genetics & having had braces a long time and stuff. anyhoo, dental surgeries ain't the most fun. and this soup has really saved me the last couple days. i can only have verrrrry soft foods for a little while, and apple sauce gets old v v fast. i've been having some of this soup with my go-to goat cheese buy, the TJ's goat cheese trio! specifically, the garlic & herb goat cheese. i heat up some soup in a pan and melt some of the garlic herb goat cheese and stir it in. 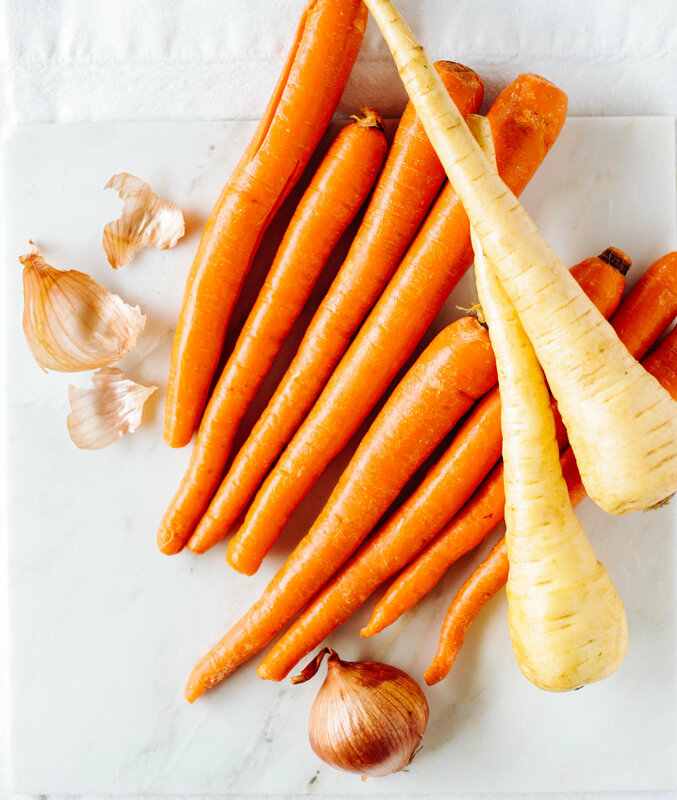 i can't have any crunchy delicious toppings right now, but i've been seriously delighted in the deliciousness that is the garlic herb goat cheese + carrot ginger parsnip soup. i think its a lot of sage in the TJ's herby goat cheese, and it REEEEALLY hits the spot. so much flavor. i don't even know who i am getting so freaking excited about soup. Preheat oven to 425 degrees F. Wash, peel, and halve the carrots and parsnips. Line a baking sheet with tin foil and a drizzle of olive oil. Spread the carrots and parsnips around the pan. Add another light drizzle of olive oil over the top and season with salt. Roast the carrots & parsnips for 30 minutes, removing from the oven and flipping them over half way through the roast. Let them cool about 5 minutes before adding to the food processor. ***While veggies are roasting, cook & chop the bacon, and make the crispy shallots. Place slightly cooled roasted carrots and parsnips in a large food processor. Add vegetable broth, olive oil, milk, and half the amount of water (2 cups). 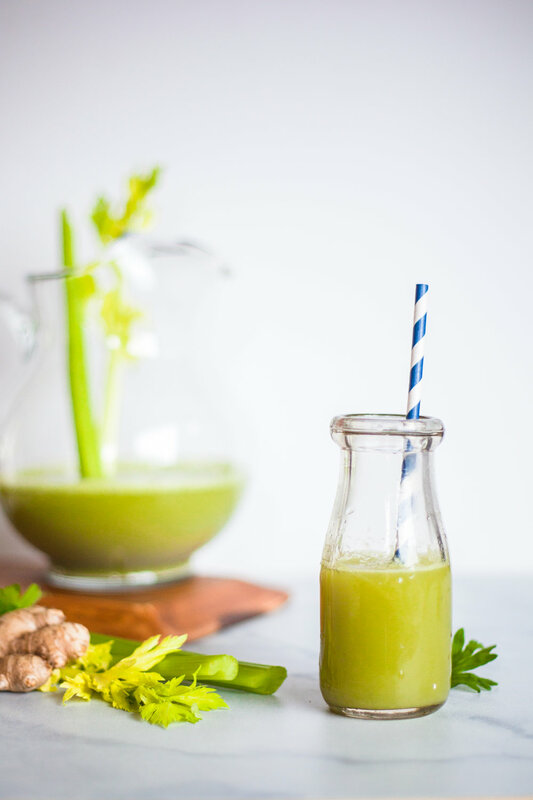 Run food processor on high speed until the veggies become smooth. Add vinegar, salt, chopped ginger, garlic clove, curry powder, and cayenne. 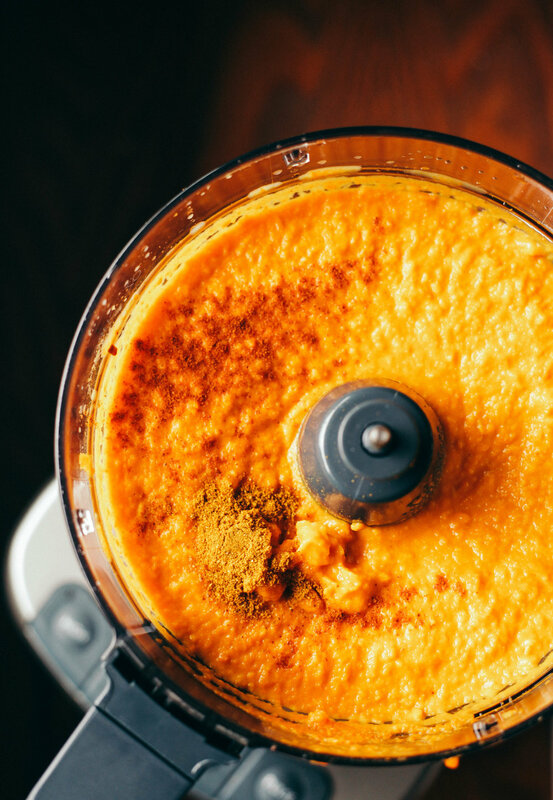 Run food processor until everything looks smooth and incorporated. The food processor will be very full at this point. Transfer the soup to a large pan or stock pot on medium/low heat. Add the other 2 cups of water and stir well. Heat a small pan to medium/low heat with a TB of olive oil. Peel the exterior off the shallot and discard. Slice the shallot into 1/8 inch thick rings. Add 2 TB of flour and some cracked black pepper to a small bowl. While the shallots are still freshly chopped and wet, coat the rings in the flour/pepper mixture. Add the rings to the heated olive oil. Let them crisp on one side for about 2-3 minutes, then carefully flip to the other side to crisp. They are done when they are browned. Be careful to not let them blacken. Remove from the pan with a fork and let them drain on a paper towel. For best results, add a hearty drizzle of goat cheese to the bottom of the soup bowl. Spoon the desired amount of hot carrot soup into the bowl. Top with plenty of goat cheese drizzle, bacon crumbles, crispy shallot rings, and fresh chives. Enjoy!